Salem College celebrates the renovation of the historic 1965 Flentrop Organ in Shirley Recital Hall with a series of free concert events featuring renowned musicians this fall in Elberson Fine Arts Center. Click here to read the Winston-Salem Journal article on the organ renovation. 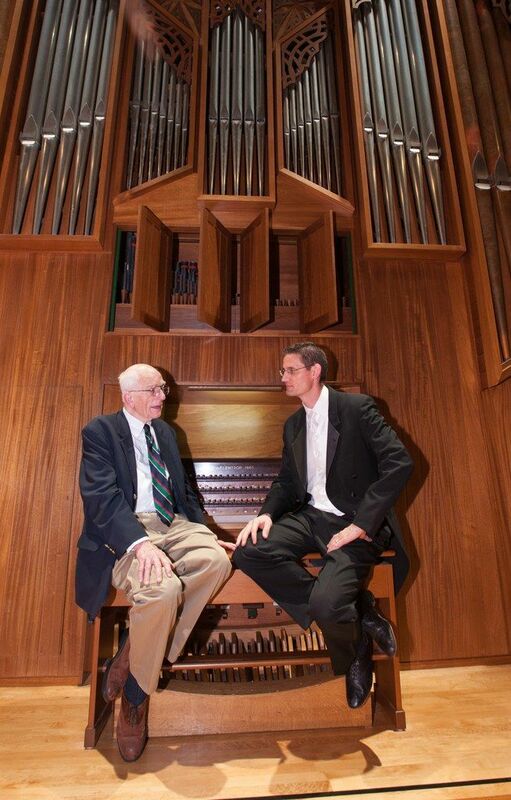 Salem College’s organ professor, Timothy Olsen, begins a series of musical events featuring the 1965 Flentrop organ. Saturday, October 19, 10 a.m.–12 p.m. This distinguished piano-world statesman returns for a recital that will include Beethoven’s Op. 109 and the Op. 77 Fantasia, Barber’s Excursions and Liszt’s Paraphrase on Verdi’s Rigoletto. Sunday, November 17, 7:30 p.m.
Monday, November 18, 10 a.m.–12:00 p.m.
One of America’s foremost flutists and pedagogues, this renowned world-class performer received the 2010 Lifetime Achievement Award from the American Flute Association. Organist Timothy Olsen teams up with his organ/trumpet duo partner and UNCSA colleague, Judith Saxton, for a program of kaleidoscopic colors drawn from the newly-renovated 1965 Flentrop organ and various trumpets and mutes.